It’s happened to all of us. That one kid we had to sit next to in class. You know the kid I’m talking about right? The one that is always goofing off during class, but never seems to get caught. Yakoi knows him. She has to sit next to him everyday and she seems to be the one always getting in trouble instead of him. This was a show of fantastic “shorts”. Each episode is only 8 minutes so it’s somewhere between a real short and a normal length Anime. None of the episodes really have anything to do with the others, except the common theme of Seki-kun screwing around in class and distracting Yakoi. In fact, she often gets so distracted she completely forgets to pay attention or study. There really isn’t much to say about this show other than it is very funny. There are basically only two characters in the entire show: Seki-kun and Yakoi. Beyond that, nearly all the talking is done by Yakoi. I’m not sure I ever heard Seki-kun say anything. It is completely clean and a wonderful show for killing some time of your own. Because each episode is pretty much self contained you don’t need to worry about forgetting what happened in the last episode. It doesn’t matter. 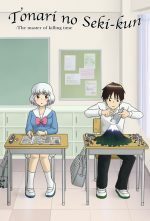 Just pick an episode to watch and enjoy as Seki-kun kills some time while you laugh at Yakoi for getting herself sucked into what he is doing. Summary: Great clean show about killing some time at school instead of paying attention to lessons.